Some investors find wood an attractive investment. While the pre-2008 housing boom supported an environment encouraging to the use of wood, subsequent relatively austere times after the Great Recession, as well as the diminishing reliance on paper in the Internet age, caused some investors to take a step back from investing in wood. But if you're interested in investing in wood, you can use a range of strategies. As an overall asset class that follows nature's timetable rather than the S&P 500, wood remains a viable opportunity. You can participate in wood investing a number of ways. Mainly the preserve of institutional investors with a long time horizon, outright ownership of timberland may be available through certain large pension funds or endowments. There are drawbacks apart from the high cost of owning woodland directly and the management responsibilities and risk involved. Direct investments in timberland require your money to be locked up for long periods of time because of the growth and maturation cycles of a natural resource, so this will not be a spur of the moment or fad purchase but a long-term commitment. 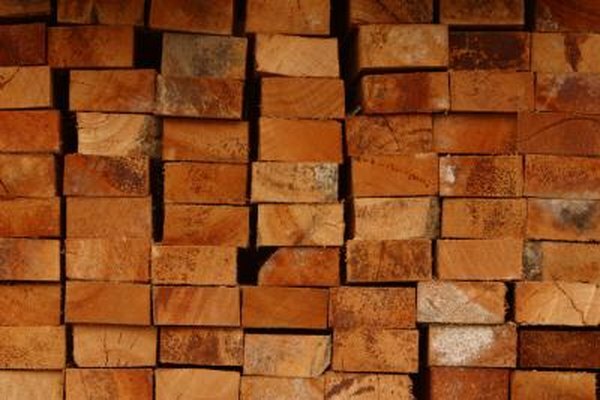 Some big manufacturers of wood and wood products, like Weyerhaeuser, are already listed in the S&P 500, so you might already be a wood investor through stock mutual funds. Timber stocks follow the housing market, so the state of that market can point to opportunities in timber. When looking at individual timber companies, scope of operations and logistical proximity of the company to major timber-hungry markets like China, can determine where you place your bets. If timber indices are more your style, iShares S&P Global Forestry and Timber Index Fund (NASDAQ: WOOD) and Claymore Beacon Global Timber Index (NYSEMKT: CUT) are two possibilities. More liquid than direct ownership in timberland, real estate investment trusts, or REITs, offer investors the ability to invest in timber-related real estate interests. Plum Creek and Rayonier are among a handful of timber-invested REITs. They are required to pay 90 percent of their earnings in dividends. The downside of REITs is that your exposure to the actual wood market may be highly variable as the REIT may invest in all manner of real estate-related activities beyond just wood, thus making this investment less of a pure play. Your timber REIT may turn out to be more correlated to the stock market than would a wood investment relying solely on the growth of trees, the noncorrelation of which might have been so appealing in the first place. You have a choice of different wood products to trade on derivatives exchanges like the CME Group. Whether you choose lumber futures or softwood and hardwood pulp futures, what you are purchasing or selling is not the physical lumber or pulp, per se, although the physical product is the underlying asset, but a contract specifying that you will buy or sell the wood product at a given time and price. Because the price of the contract is just a fraction of that of the actual wood it controls, there is said to be leverage in futures, that can work for or against you. You can trade these yourself through a brokerage firm or have a broker place the trades for you. However, be aware of the risks involved. Advisor Perspectives: Timber as an Asset Class: If a Tree Falls in the Forest, Should You Buy It?